Transforaminal approach in the lumbar spine has been one of the most popular approaches to access the disc and interbody region since its description by Harms and Rolinger. 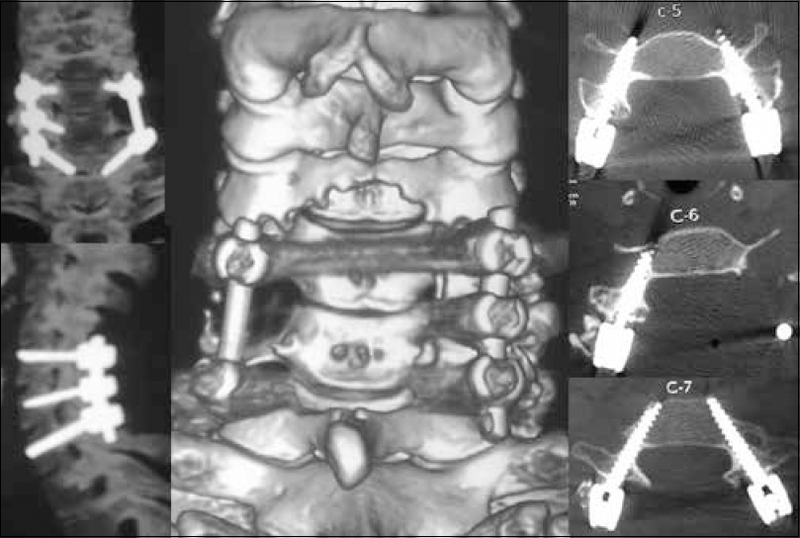 The success and popularity of the transforaminal approach in the lumbar spine has been made possible by the safe and routine use of pedicle screws in the lumbar spine. Transforaminal approach to the disc and cervical body is not practiced due to the relatively rare use of cervical pedicle screws (CPS) in the lower cervical spine. This is largely due to the feared complications of CPS in the lower cervical spine. Few studies on cadavers have pointed out the high incidence of pedicle screw misplacement in the cervical spine (16.8%–87.5%) and have questioned the clinical use of the same.,, However, clinical studies have shown minimal screw-related complications ,, and have highlighted the advantages of using CPS. A safe and reliable use of CPS in lower cervical spine facilitates the transforaminal approach, similar to that in the lumbar spine. Transforaminal approach can give access to the disc and the vertebral body anteriorly and avoid an additional anterior approach in certain clinical situations. The authors have been routinely using CPS with medial cortical pedicle screw technique ,, for the stabilization of lower cervical spine and wish to share their experience on the feasibility and safety of transforaminal approach in the lower cervical spine. This is a retrospective study. 15 patients who underwent transforaminal approach with CPS instrumentation at our institute from July 2011 to October 2014 were enrolled. During this period, a total of 45 patients underwent posterior cervical surgeries with CPS instrumentation. Twenty-eight patients had cervical traumatic fractures, 16 patients had cervical spondylotic myelopathy and 1 patient had intradural dumb-bell tumor of the cervical spine. 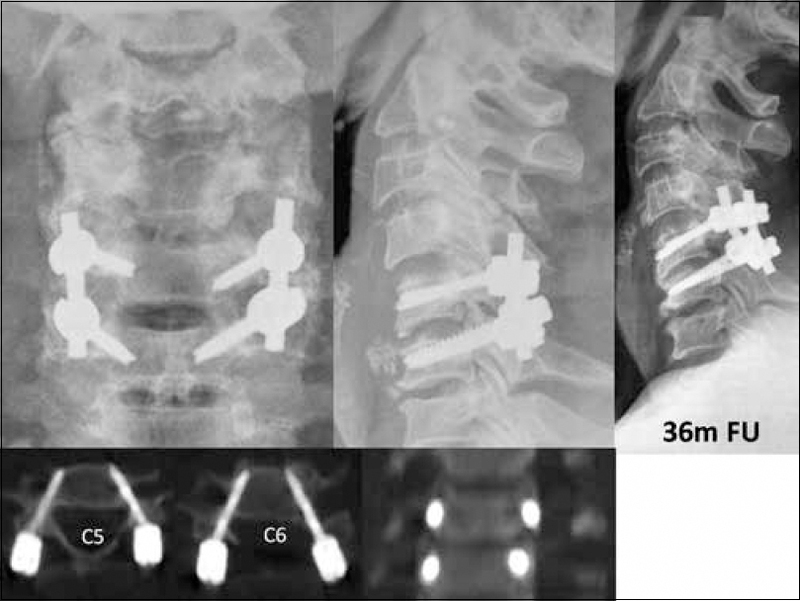 Among these, 15 patients underwent transforaminal approach with partial facetectomy for either transforaminal decompression or discectomy with interbody fusions depending on the requirement of decompression of the cervical spinal cord. Of the 15 patients, 5 patients underwent foraminal decompression alone (Group-1 two patients had cervical traumatic subluxation, one had an intradural tumor and 2 had foraminal stenosis with cervical myelopathy). 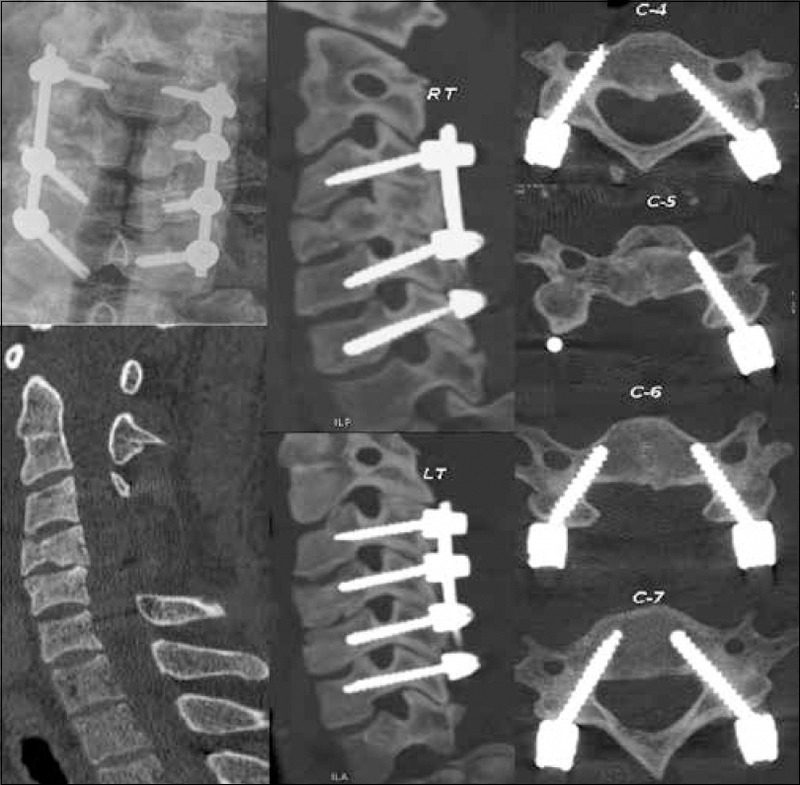 With more experience, 9 patients underwent transforaminal cervical interbody fusion (TCIF) with foraminal decompression, discectomy, and insertion of bone chips in the interbody region along with pedicle screw-rod instrumentation (Group-2: 7 patients had traumatic subluxation; two had trauma on spondylotic myelopathy;), and 1 patient underwent partial corpectomy (Group-3: 1 patient with C5 burst fracture) with pedicle screw instrumentation [Table 1]. The authors used the medial cortical pedicle screw technique for cervical pedicle screw insertion, described earlier., The medial 2/3rd of the lateral mass, forming the roof of the foraminal area, was sequentially drilled with a 3 mm cutting high-speed burr, taking care to stop as the anterior cortex of the superior articular facet was reached. The thinned-out portion of the superior articular facet was taken out with 1–2-mm rongeurs having thin foot plates, over the corresponding cervical root [Figure 1] and [Video 1], available online]. Adjacent portions of the corresponding laminae were partially removed to expose the dura and the origin of the cervical root. Extensile measures with removal of the adjacent complete laminae and/or total facetectomy were performed depending on the necessity for decompression and the extent of window required [Figure 1] and [Figure 2]. The foraminal region consists of the cervical nerve root passing in the lower aspect, closely abutting the cranial wall of the pedicle below and directly overlying the disc space and the uncinate process of the lower vertebra [Figure 2] and [Figure 3]. The disc space and uncinate process were accessed by retracting the nerve root cranially. Epidural bleeding was controlled at this stage with a combination of bipolar coagulation, gel foams, and cotton patties. The authors preferred to partially drill the uncinate process with a 2-mm diamond-tipped burr, directed medially, preserving the lateral wall of the uncinate intact, [Figure 2] and [Figure 3] which protected the vertebral artery [Video 2, available online]. A Watson–Cheyne dissector was used to retract the root cranially and rested on the uncinate process acting as a restraint, preventing the breaching of the lateral wall of uncinate process. This enabled us to have adequate access to the disc space, at a more-steeper medial angulation, just above the superior pedicle wall. The entry into the disc at a more-steeper angle also gave us the access to decompress more medial aspect of the central canal, with minimal retraction of the dura [Figure 4] and [Video 2, available online]. The access to the foraminal area and the disc was further increased by distracting the interbody region over the rod inserted on the contralateral pedicle screws, similar to lumbar TLIF. The screw in the lower pedicle on the side of interbody approach was deliberately not inserted until the interbody work was completed [Figure 4]. The disc space was entered with a 1-mm micro-disc punch, and the end plates were curetted with small 1-mm curettes [Video 3, available online]. Small chips of bone derived from the lamina were inserted into the interbody region to aide in fusion [Video 4, available online]. The lower pedicle screw on the side of the TCIF was inserted, and the distraction on the contralateral side was reversed before closure. The average follow-up was 34.6 months (22–64 months). All patients were evaluated for placement of pedicle screws and the interbody graft positioning (Group II) with postoperative CT scans. Pedicle screw perforations were graded with following Criteria: Grade I perforations having ≤50% of the screw outside the pedicle and Grade II perforations having >50% of the screw outside the pedicle. Clinical complications directly related to cervical pedicle screw placement screw were also recorded. All patients were evaluated preoperatively and postoperatively for clinical improvement using modified Japanese Orthopaedic Association (mJOA) scoring. The average age was 45 years (25–80 years). The average blood loss was 198 ml (100–450 ml) and the average operative time was 142 min (90–200 min). A total of 63 pedicle screws were placed with two patients undergoing only a transforaminal decompression without any pedicle screw instrumentation [patients 4 and 5, [Table 2]. Eighteen screws were misplaced (28.57%), with 10 (15.8%) of them having Grade-I medial perforations, 4 (6.34%) having Grade-II medial perforations, and another 4 (6.34%) having Grade-I lateral perforation. There were no Grade-II lateral perforations. As the authors used the medial cortical pedicle screw technique for placement of pedicle screws,, the lateral perforations were minimal and most of the perforations were Grade-I medial perforations (15.8%). Interbody graft pieces extruded anteriorly in 4 of the traumatic subluxation patients (Group-II) without any clinical consequences. The preoperative mJOA score of 11.4 (0–15) improved to 15.73 (0–18) at the final follow-up [Table 3]. Patient 2 had complete quadriplegia preoperatively and succumbed to respiratory failure at 5 weeks without any neurological or functional improvement. Apart from one patient succumbing to respiratory failure, we had one postoperative C5 palsy (patient 14) which improved to normal power, 14 weeks after surgery. We had two patients with dural tear at the axilla of the nerve root due to retraction, which did not affect their clinical outcome. We wish to share a few patients' details and pictures which helped the authors to move up the learning ladder. A 27-year-old female was diagnosed to have dumb-bell tumor of her left C6 root with intradural extension. She presented with clinically progressive left elbow and wrist weakness with myelopathy signs. She underwent surgery with tumor excision and C5 to C7 pedicle screw-rod instrumentation with left transforaminal approach [Figure 5], [Figure 6], [Figure 7]. She recovered well and has completed 26 months of follow-up with no further complaints. The histopathology confirmed the tumor as Schwannoma. Her preoperative mJOA of 13 had improved to 18 at last follow-up. A 35-year-old male came to us with C5–C6 fracture and bifacetal subluxation with myelopathy (mJOA 13) and left elbow weakness. He had an acute disc herniation on MRI and was counseled about the possible anterior surgery requirement after posterior stabilization. After posterior pedicle screw insertion and reduction with distraction, a left-sided partial facetectomy was done along with laminectomy. 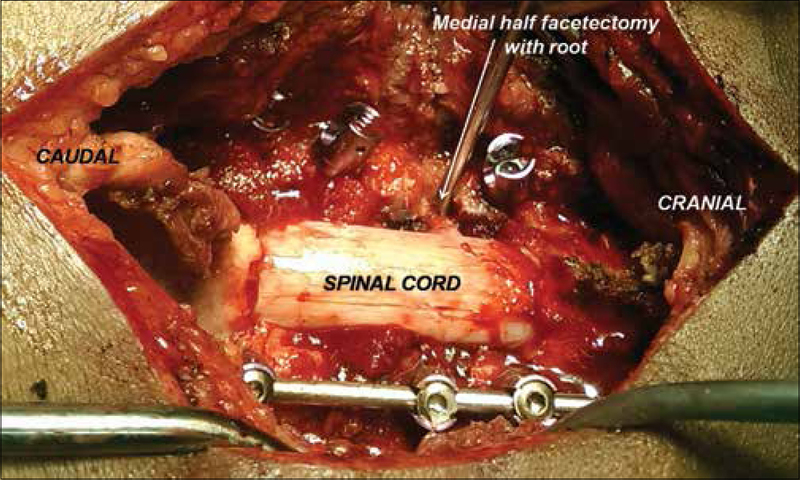 The extruded disc was easily removed after retraction of the nerve root cranially. The disc space was accessed by drilling the uncinate process of C6 and a few bone chips were inserted. 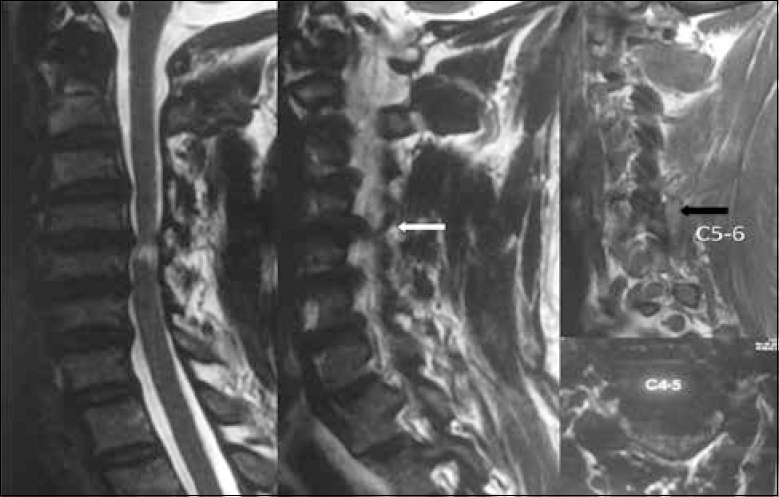 Although there was anterior extrusion of the graft, C5–C6 fused with slight kyphosis [Figure 8] and [Figure 9]. The patient improved to mJOA 18 at 3-month postoperatively. A 48-year-old male came to us with acute quadriparesis with a history of fall (mJOA 5). 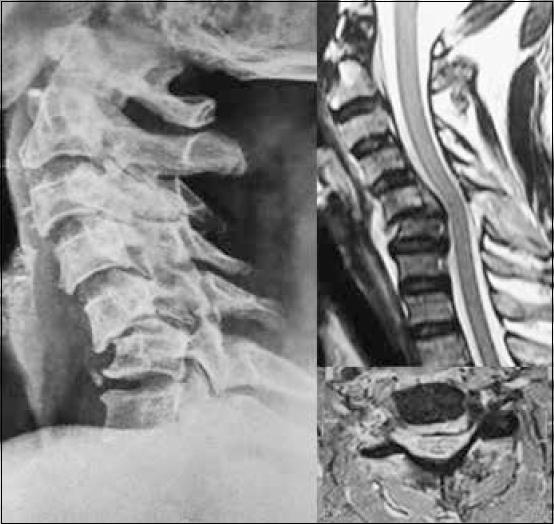 The patient had chronic myelopathy symptoms with progressive imbalance for the past 6 months and came to us with acute central cord syndrome due to whiplash, presenting with 1/5 power in upper limbs and 3/5 power in his lower limb. 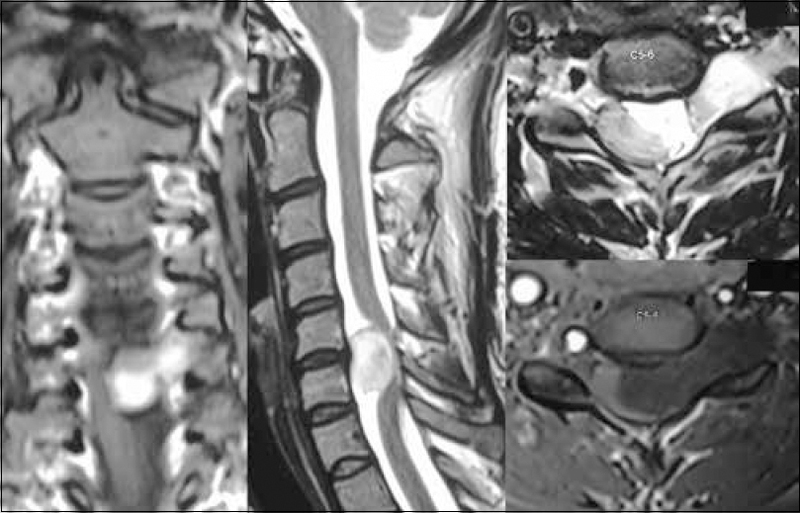 His images showed C4–C5 myelomalacia with posterior ligamentous complex (PLC) injury (hyperintense PLC on T2 images) and moderate cervical kyphosis from C4–C6. Intraoperatively, the authors observed an undisplaced facetal fracture at C5–C6 level [Figure 10]. He underwent C4, C5, and C6 laminectomy and pedicle screw-rod instrumentation from C4 to C7 with decompression and kyphosis correction. The patient had left C4-C5 foraminal disc extrusion for which a transforaminal discectomy and interbody bone grafting was done [Figure 10], [Figure 11], [Figure 12]. The patient developed postoperative infection with meningitis for which he required prolonged ICU care, but improved over 1 year, and at present, his mJOA has improved from 5 to 13. A 34-year-old male come to us with the right upper limb weakness (⅖ power) and both lower limb paresis (⅗ power) with spasticity (mJOA-7). The MR Imaging showed C5 burst fracture (C2–C3 fused mass) with posterior displacement of the right-sided bony fragment causing compression of the cord. The PLC was disrupted along with laminar fractures and facet fractures at C4, C5, and C6. The patient also had a vertical split fracture of the C6 body [Figure 13], postoperative AP radiograph]. The patient underwent posterior pedicle screw instrumentation from C4 to C7 with removal of fractured laminae of C3, C4, and C5. The posteriorly displaced, right-sided bony fragment was approached by partial drilling of the medial wall of the C5 pedicle, and we were able to partially drill and push back the fragment anteriorly through this window [Figure 13], [Figure 14], [Figure 15]. The patient did well postoperatively and was able to walk without support at 3-month follow-up. The right upper limb weakness had partially recovered at the final follow-up (mJOA of 7 had improved to 14). The present study describes the authors' experience on the relative feasibility of posterior transforaminal approach in the lower cervical spine. Posterior approach to the foramen is not something new. Posterior foraminotomy and discectomy has long been successfully practiced with good results. The approach was limited by the amount of lateral mass and lamina that could be removed due to concerns of inducing instability. The advent of safe placement of CPS has given us the opportunity to enlarge this window laterally with partial or total facetectomy. The transforaminal approach to the disc is from a more lateral zone with partial facetectomy (half to 2/3rd) and at a more-steeper angle than the conventional posterior foraminotomy approach. The approach involves entry into the disc space by drilling the uncinate process with protection of the vertebral artery, placed lateral to the uncinate process. To begin with, the authors were concerned about the proximity and dangers of vertebral artery injury with a more lateral entry into the transforaminal area. However, we found the uncinate process to be a reliable and safe landmark in the foraminal region to avoid injury to the vertebral artery. There have been few reports in the literature of transforaminal approach in patients with lower cervical fracture dislocations with herniated disc. Park et al. reported on removal of the herniated disc fragment through foraminotomy in 7 patients with cervical fracture dislocation and traumatic disc herniation along with use of CPS in a single posterior approach. Nakashima et al. reported on 40 patients with cervical facet dislocations and disc herniation, who underwent posterior pedicle screw instrumentation and reduction. The authors had planned for an anterior procedure in the event of increase in disc herniation during posterior reduction, but they did not require the anterior procedure in any of their patients. To the best of our knowledge, transforaminal approach to the interbody area with endplate curettage and bone grafting has not been described previously. 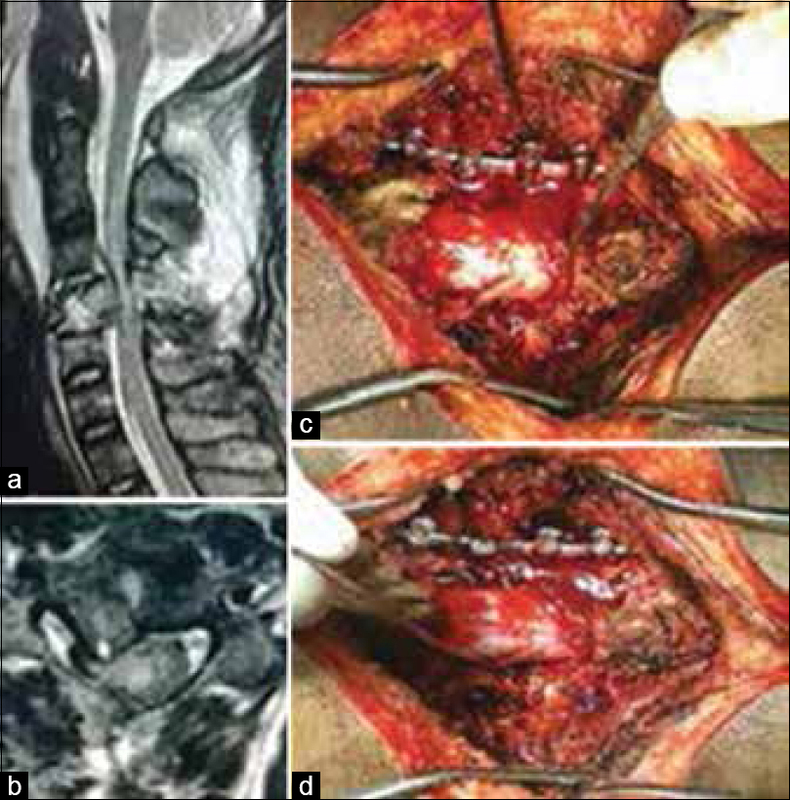 Cervical tumors extending from spinal canal to facets and/or lateral aspect of vertebral body: These can be addressed with single stage posterior approach with pedicle screw-rod instrumentation with complete facetectomy providing access for lateral dissection of the tumor mass from vertebral vessels and also to gain posterolateral access to vertebral body for additional debridement/excision of the tumor. The advantage of the transforaminal approach lies in the access gained to the anterior structures of the cervical spine from the posterior aspect. Further, the access to the disc and the vertebral body is from a more lateral zone and at a more-steeper angle compared to the conventional posterior foraminotomy approach. This gives the surgeon access to the lateral and central portions of the interbody area without undue retraction of the cervical cord. This approach can avoid an additional anterior procedure as the goals of anterior decompression rigid 3-column stabilization (using CPS) and interbody fusion can be achieved by a single posterior approach at least in clinical situations described above. However, the technique is still not mature in the sense that it does not provide a rigid interbody spacer support and the interbody fusions occur with segmental kyphosis. A front back procedure with a good interbody spacer and a posterior lateral mass stabilization can give a better result in terms of preserving the cervical sagittal alignment with rigid fusion. Further, using the currently available interbody curette, results in an inadequate interbody endplate preparation, leading to inadequate bridging bone formation. However, these drawbacks can be addressed in the future with appropriate interbody devices and improvization of instrumentation for interbody work in the area. Lateral mass posterior instrumentation in the lower cervical spine is a time-tested familiar method of stabilization and sufficient in most of the situations requiring cervical stabilization. However, the authors believe that with the routine and safe use of cervical pedicle screw instrumentation the evolution of a versatile technique like the transforaminal decompressions and interbody fusions is only a matter of time. The study is limited by the small size of the study group with heterogeneous pathology and being limited to a single center. However, the present study opens the door to a new approach to the anterior structures in the lower cervical spine from behind. The authors encourage the procedure to be evaluated by surgeons routinely performing cervical pedicle screw insertion in the lower cervical spine for its safety and feasibility. Transforaminal approach in lower cervical spine, though has a learning curve, seems to be a feasible technique along with the use of CPS and opens the door to a new approach to the anterior structures in the lower cervical spine. Safety and reproducibility of the approach needs to be substantiated with a larger study. Further, TCIF can avoid an additional anterior surgery in certain situations in the cervical spine. Harms J, Rolinger H. A one-stager procedure in operative treatment of spondylolistheses: Dorsal traction-reposition and anterior fusion (author's transl). Z Orthop Ihre Grenzgeb 1982;120:343-7. Karaikovic EE, Yingsakmongkol W, Gaines RW Jr. Accuracy of cervical pedicle screw placement using the funnel technique. Spine (Phila Pa 1976) 2001;26:2456-62. Ludwig SC, Kramer DL, Balderston RA, Vaccaro AR, Foley KF, Albert TJ, et al. Placement of pedicle screws in the human cadaveric cervical spine: Comparative accuracy of three techniques. Spine (Phila Pa 1976) 2000;25:1655-67. Miller RM, Ebraheim NA, Xu R, Yeasting RA. 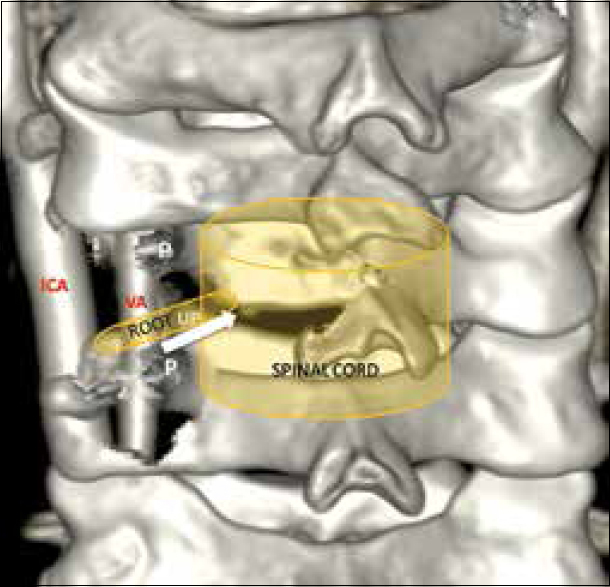 Anatomic consideration of transpedicular screw placement in the cervical spine. An analysis of two approaches. Spine (Phila Pa 1976) 1996;21:2317-22. Abumi K, Shono Y, Ito M, Taneichi H, Kotani Y, Kaneda K, et al. 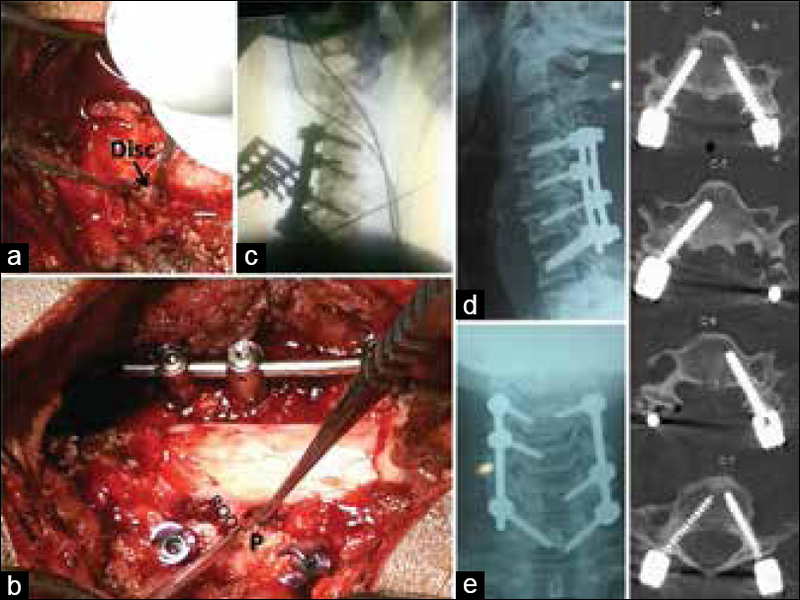 Complications of pedicle screw fixation in reconstructive surgery of the cervical spine. Spine (Phila Pa 1976) 2000;25:962-9. 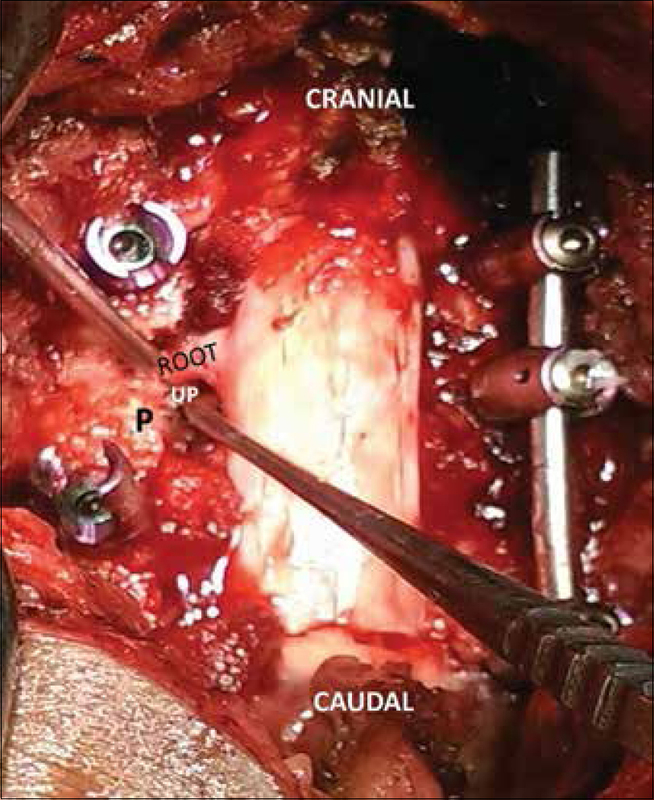 Abumi K, Kaneda K. Pedicle screw fixation for nontraumatic lesions of the cervical spine. Spine (Phila Pa 1976) 1997;22:1853-63. Park JH, Jeon SR, Roh SW, Kim JH, Rhim SC. 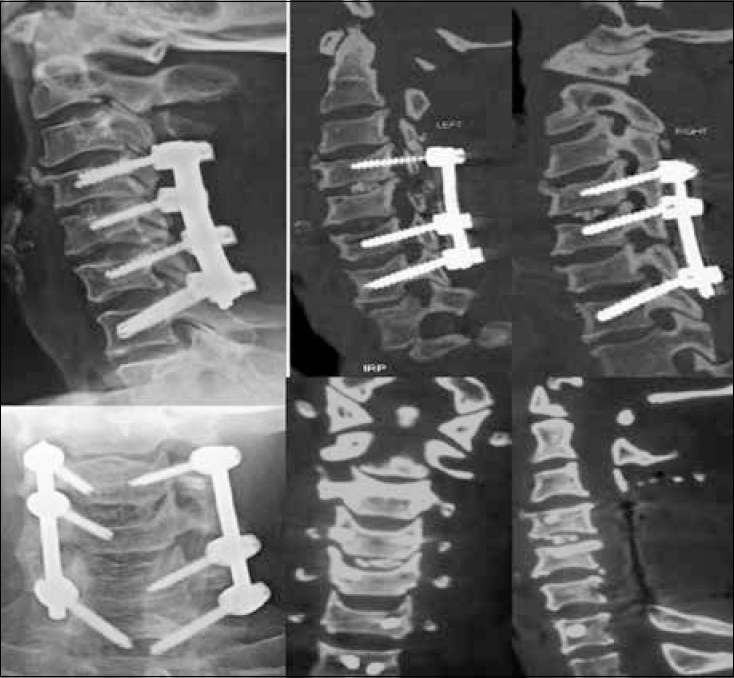 The safety and accuracy of freehand pedicle screw placement in the subaxial cervical spine: A series of 45 consecutive patients. Spine (Phila Pa 1976) 2014;39:280-5. 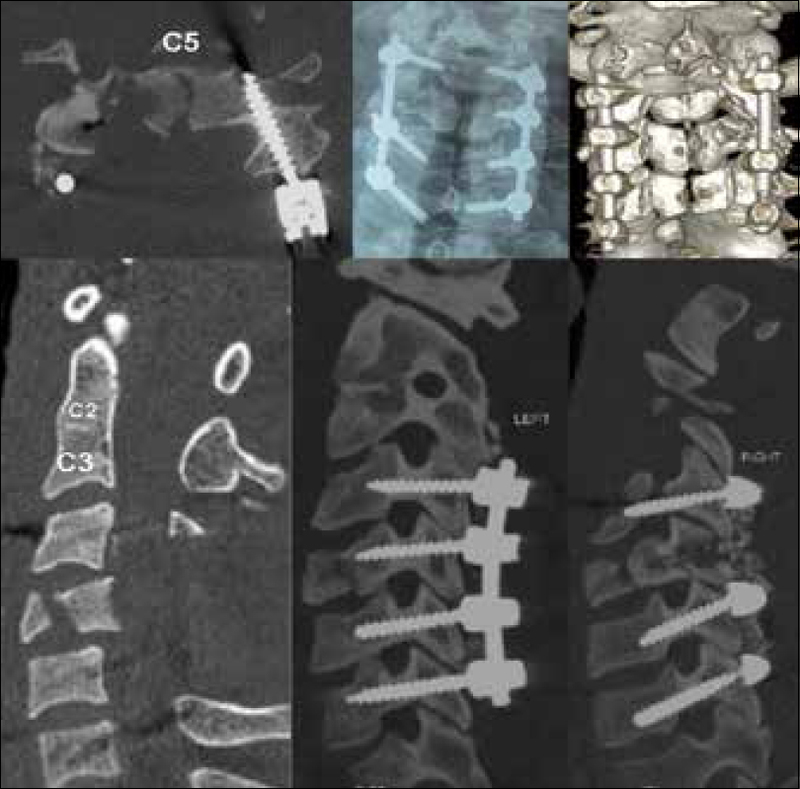 Mahesh B, Upendra B, Vijay S, Arun K, Srinivasa R. Perforations and angulations of 324 cervical medial cortical pedicle screws: A possible guide to avoid lateral perforations with use of pedicle screws in lower cervical spine. Spine J 2017;17:457-65. Mahesh B, Upendra B, Mahan RS. The medial cortical pedicle screw – A new technique for cervical pedicle screw placement with partial drilling of medial cortex. Spine J 2014;14:371-80. 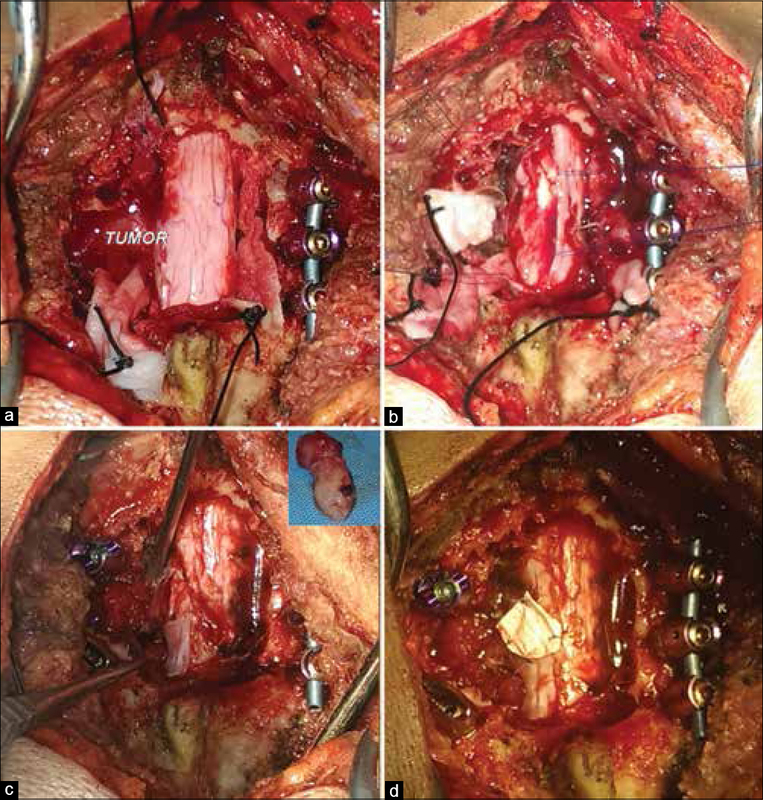 Mahesh B, Upendra B, Vijay S, Arun K, Srinivasa R. Addressing stretch myelopathy in multilevel cervical kyphosis with posterior surgery using cervical pedicle screws. Asian Spine J 2016;10:1007-17. Nakashima H, Yukawa Y, Imagama S, Kanemura T, Kamiya M, Yanase M, et al. Complications of cervical pedicle screw fixation for nontraumatic lesions: A multicenter study of 84 patients. 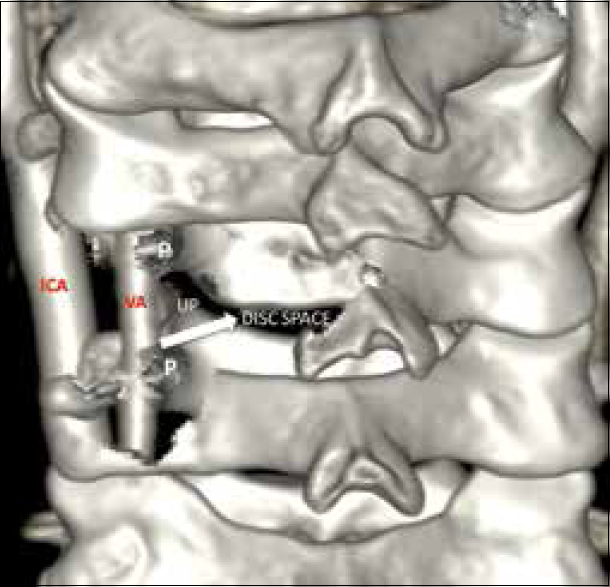 J Neurosurg Spine 2012;16:238-47. Kopjar B, Tetreault L, Kalsi-Ryan S, Fehlings M. Psychometric properties of the modified Japanese Orthopaedic Association scale in patients with cervical spondylotic myelopathy. Spine (Phila Pa 1976) 2015;40:E23-8. Ducker TB, Zeidman SM. The posterior operative approach for cervical radiculopathy. Neurosurg Clin N Am 1993;4:61-74. Park JH, Roh SW, Rhim SC. A single-stage posterior approach with open reduction and pedicle screw fixation in subaxial cervical facet dislocations. J Neurosurg Spine 2015;23:35-41. Nakashima H, Yukawa Y, Ito K, Machino M, El Zahlawy H, Kato F, et al. Posterior approach for cervical fracture-dislocations with traumatic disc herniation. Eur Spine J 2011;20:387-94.